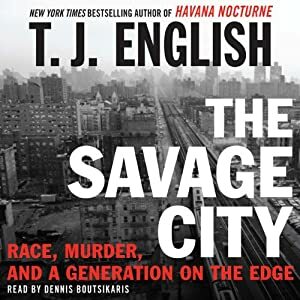 The Savage City is about 10 years in the history of race relations in New York City, from 1963 to 1973. It starts with a murder of two young women in Manhattan. It was a time when the city had been recently transformed by the arrival of large numbers of African-Americans from the South, looking for work as the rural economy was transformed by new farm machines. Whole neighborhoods had changed from white to black in just a few years, as the former occupants moved out to the suburbs. The police were racist and also corrupt, so it was no surprise that there was severe tension between them and the minority population, which would soon lead to rioting. TJ English tells this story through the framing of one young man, George Whitmore, for the murder of the two "career girls." It's a fascinating narrative in the context of race struggles, the politics of Martin Luther King, Malcolm X and the Black Panther movement. The murder, followed by the detention and questioning of Whitmore, his many trials, and his imprisonment and appeals, makes for great reading. It provides English a way to set out the social history surrounding these events, and so the book is educational too. The performance of the unabridged audiobook by Dennis Boutsikaris is engaging, read with energy and authority. Recommended for those who are interested in the history of New York and race in America.